CBI - China: Day 45 of 154 of the Japanese Invasion of Manchuria. 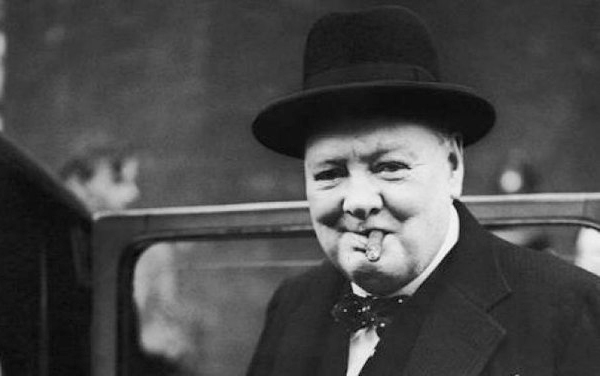 UK: On learning of a German boast that the Italians are now on their side, Winston Churchill quips, "It's only fair. We had to have them in the last war." Germany and Italy, reflecting their common interest in destabilizing the European order, announced a Rome-Berlin Axis on 01 Nov 36, one week after signing a treaty of friendship. On learning of a German boast that the Italians were now on their side, Winston Churchill quipped, "It's only fair. We had to have them in the last war." "A modest man, who has much to be modest about." "I wish Stanley Baldwin no ill, but it would have been much better if he had never lived." "He occasionally stumbled over the truth, but hastily picked himself up and hurried on as if nothing had happened." Spain: Day 108 of 985 of the Spanish Civil War. CBI - China: Day 13 of 29 of the 1st Battle of Suiyuan. Spain: Day 473 of 985 of the Spanish Civil War. CBI - China: Day 118 of 2,987 of the 2nd Sino-Japanese War. Day 81 of 106 of the 2nd Battle of Shanghai. Day 62 of 70 of the Battle of Taiyuan. Spain: Day 838 of 985 of the Spanish Civil War. CBI - China: Day 483 of 2,987 of the 2nd Sino-Japanese War. Day 21 of 81 of Japan's Operation GUANGDONG. CBI - China: Day 848 of 2,987 of the 2nd Sino-Japanese War. ETO - UK: Day 57 of 258 of the Blitz. ETO - France: British lay mines off France in the Bay of Biscay. MTO - Turkey: Turkey declares itself neutral in Greco-Italian war. East Africa: Day 145 of 537 of Italy's East African campaign in the lands south of Egypt. CBI - China: Day 1,214 of 2,987 of the 2nd Sino-Japanese War. Day 353 of 381 of the Battle of South Guangxi. CBI - Thailand: Day 32 of 221 of the Franco-Thai War (Vichy France vs Thailand). Russian Front - Finland: Day 126 of 142 of Operation SILVER FOX, a joint German-Finnish campaign to capture the Russian port of Murmansk in the Arctic. Russian Front - Finland: Day 124 of 140 of Operation ARCTIC FOX, a joint German-Finnish campaign against Soviet Northern Front defenses at Salla, Finland. Russian Front - Finland: Day 133 of 164 of the Battle of Hanko. The Soviets will be forced off their leased naval base. Russian Front: Day 133 of 167 of Germany's Operation BARBAROSSA. Russian Front - North: Day 55 of 872 of the Siege of Leningrad. Russian Front - Center: Day 31 of 98 of the Battle of Moscow. Russian Front - South: Day 3 of 248 of the Siege of Sevastopol, Crimean Peninsula. German troops take Simferopol, the capital of the Crimea, and then move in on Sevastopol. MTO - Libya: Day 206 of 256 of the Siege of Tobruk. The RAF attacks Benghazi and Tripoli. East Africa: Day 510 of 537 of Italy's East African campaign in the lands south of Egypt. CBI - China: Day 1,579 of 2,987 of the 2nd Sino-Japanese War. Russian Front - North: Day 420 of 872 of the Siege of Leningrad. Russian Front - North: Day 181 of 658 of the Siege of the Kholm Pocket, USSR lays siege to the Kholm Pocket but the Germans hold out for a about a year and a half. Russian Front - South: Day 127 of 150 of Germany's CASE BLUE, the failed offensive to take the Caucasus oil fields. Russian Front - South: Day 71 of 165 of the Battle of Stalingrad, bloodiest battle in human history. MTO - Egypt: Day 10 of 20 of the 2nd Battle of El Alamein. Operation SUPERCHARGE: Allies break the Axis lines at El Alamein. US planes continue flying ground support. MTO - Greece: US B-24s and escorting P-40s attack Maleme Airdrome at Crete. East Africa: Day 181 of 186 of the Battle of Madagascar. CBI - China: Day 1,944 of 2,987 of the 2nd Sino-Japanese War. PTO - Alaska: Day 148 of 435 of the Battle of Kiska, Aleutian Islands. The US and Canada will defeat the Japanese invaders. PTO - Malaya: Day 256 of 357 of the Battle of Timor Island, a long guerrilla war ending in Japanese victory. PTO - New Guinea: Day 104 of 119 of the Battle of the Kokoda Track. The Australians continue pushing back the Japanese troops. PTO - Solomon Islands: Day 87 of 187 of the Battle of Guadalcanal. Russian Front - North: Day 785 of 872 of the Siege of Leningrad. Russian Front - North: Day 546 of 658 of the Siege of the Kholm Pocket. USSR lays siege to the Kholm Pocket but the Germans hold out for a about a year and a half. Russian Front - South: Day 70 of 122 of the Battle of the Lower Dnieper River, USSR. Russian Front - South: The Red Army achieves a landing across the Strait of Kerch from the Taman peninsula which severs all German land links with the Crimea. MTO - Italy: US 12th Air Force provides air support. MTO - Italy: The US Army Middle East Air Force (USAMEAF) is redesignated as the US 15th Air Force. CBI - China: Day 2,309 of 2,987 of the 2nd Sino-Japanese War. PTO - New Guinea: Day 44 of 219 of the Battle of Shaggy Ridge. PTO - New Guinea: Day 41 of 162 of the Battle of the Huon Peninsula. PTO - Solomon Islands: Day 1 of 295 of the Battle of the Bougainville Islands. PTO - Solomon Islands: Day 1 of 2 of the Naval Battle of Empress Augusta Bay. US 3rd Marine Division lands and takes the island during a confusing naval battle off shore. USA - California: The first of over 9,300 incendiary balloon bombs launched from Tokyo reaches the west coast of the USA via the jet stream. These Japanese balloon bombs, known as Fu-Go (Windship Weapon), were designed as a cheap weapon intended to make use of the jet stream over the Pacific Ocean to wreak havoc on Canadian and American cities, forests, and farmland. They were hydrogen filled and carried a load varying from a single 33 lb antipersonnel bomb to a 26 lb incendiary bomb with 4 11 lb incendiary devices attached. 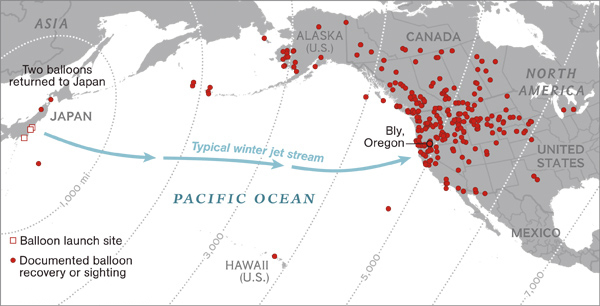 The Japanese had discovered what would eventually become known as the jet stream, which blew at altitudes above 30,000 ft and could carry a large balloon across the Pacific in three days, over a distance of more than 5,000 miles. Japan's expectation was that perhaps 10% of these balloon bombs would make their way across the Pacific and would terrorize cities and ignite hundreds of forest fires all along the western United States and Canada. 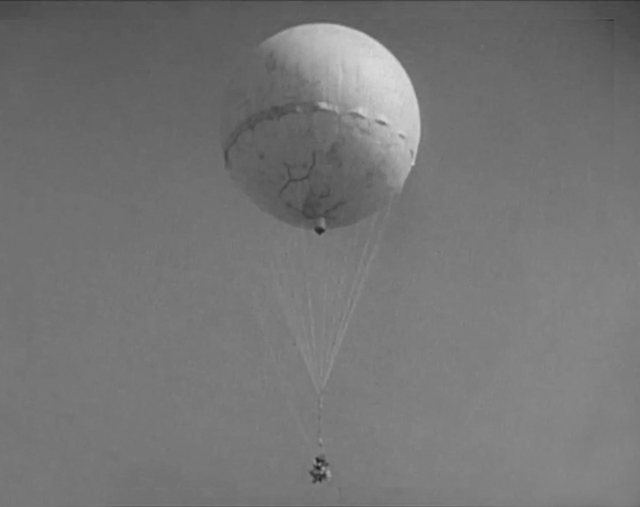 The design of the balloon bombs required an innovative control system to deal with expansion of the hydrogen gas when warmed by sunlight and contraction when it cooled at night. An altimeter triggered venting of hydrogen when it rose too high and releasing of attached sandbags when it dropped too low. Japan launched over 9,300 balloon bombs from late 1944 through April 1945, about 300 of which were found or observed in Alaska, Washington, Oregon, California, Arizona, Idaho, Montana, Utah, Wyoming, Colorado, Texas, Kansas, Nebraska, South Dakota, North Dakota, Michigan and Iowa, as well as in Mexico and Canada. The balloons were relatively ineffective as weapons with a kill rate of only 0.067%, which came about on 05 May 45 when a pregnant woman and five children on a church picnic were killed when a balloon bomb discovered in a forest in Oregon exploded. Thanks in part to American and Canadian press withholding of ballon sightings and landings, the Japanese believed that the mission had been a total fiasco. By April of 1945, when B-29s destroyed two of the three needed hydrogen plants, the project was shut down. 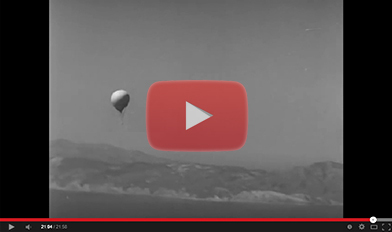 This 22-minute video entitled "Japanese Paper Balloon" is a US Navy Training Film produced in 1945 to instruct personnel on their ingenious design and how to disarm them. ETO - France: Day 93 of 284 of the Battle of Brittany. ETO - Belgium: Day 61 of 62 of the liberation of Belgium. ETO - Belgium: Day 31 of 38 of the Battle of the Scheldt Estuary. The British Royal Marines and Army Commandos land on Dutch island of Walcheren off the Scheldt Estuary in an attempt to clear the German defenders from this strategic island. ETO - France: Day 48 of 236 of the Siege of Dunkirk. ETO - Germany: Day 44 of 145 of the Battle of Hürtgen Forest. ETO - Germany: US 8th Air Force attacks synthetic oil plants near Gelsenkirchen. Russian Front - Finland: Day 48 of 223 of the Lapland War. Finland and Russia have joined forces to kick the Germans out of Finland's most northern province. Russian Front - Center: Day 18 of 206 of the Battle of the Courland Pocket in Latvia. Soviet troops capture Riga. Russian Front - Center: Day 11 of 99 of the Siege of Memel, a border town of Lithuania and East Prussia. Russian Front - Center: Day 49 of 72 of the Battle into East Prussia and northern Poland. Russian Front - South: Day 4 of 108 of the Battle of Budapest, Hungary. Russian Front - South: Day 49 of 72 of the Battle of Belgrade, Yugoslavia. MTO -Italy : US 12th Air Force fighters attack enemy logistical lines. MTO: US 15th Air Force bombs targets in Italy, Germany, Hungary, Austria, and Yugoslavia. CBI - Burma: Day 215 of 302 of the Chinese Salween Offensive in Burma. CBI - China: Day 2,675 of 2,987 of the 2nd Sino-Japanese War. Day 199 of 259 of Japan's Operation ICHI-GO. PTO - New Guinea: Day 310 of 597 of the Battle of New Britain. PTO - New Guinea: Day 194 of 481 of the Battle of Western New Guinea. PTO - Palau Islands: Day 48 of 74 of the Battle of Peleliu (Operation STALEMATE II). PTO - Philippines: Day 13 of 299 of the 2nd Battle of the Philippines, aka the Liberation of the Philippines or the Philippines Campaign. PTO - Philippines: Day 13 of 73 of the Battle of Leyte. 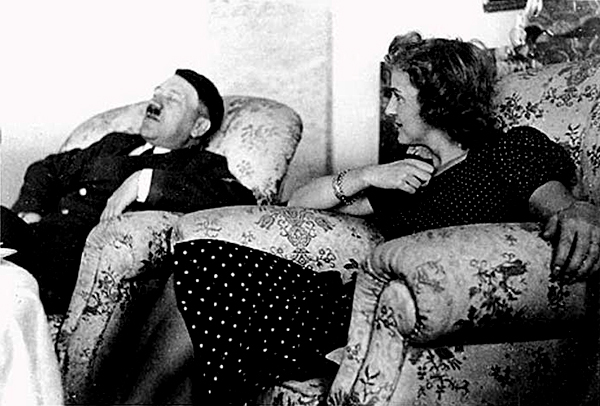 UK: British Intelligence reports that Hitler probably committed suicide on the 30th April in Berlin after marrying his mistress, Eva Braun. 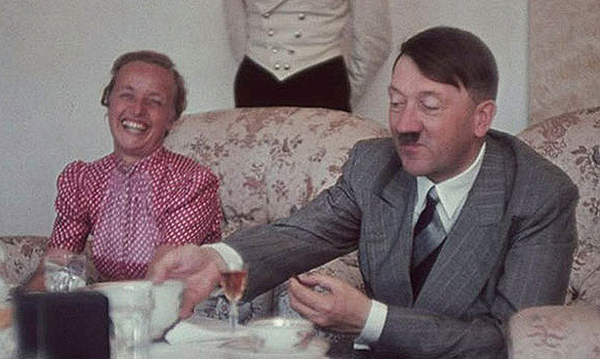 The fact that Adolf and Eva's marriage lasted only one day 'til death did they part should not be construed as a blanket indictment against the institution of marriage. The timely and amazing Sir Winston Churchill was perhaps the greatest statesman in history and a master wordsmith to boot, both in phrasing the serious as well as the absurd. Intended to spark forest fires and shake American morale, Japan's balloons were beset by technical problems and never achieved their destructive potential.